Action Center is where you can find the entire set notifications concentrated at one place. It is also from where you can access the settings of the system quickly. 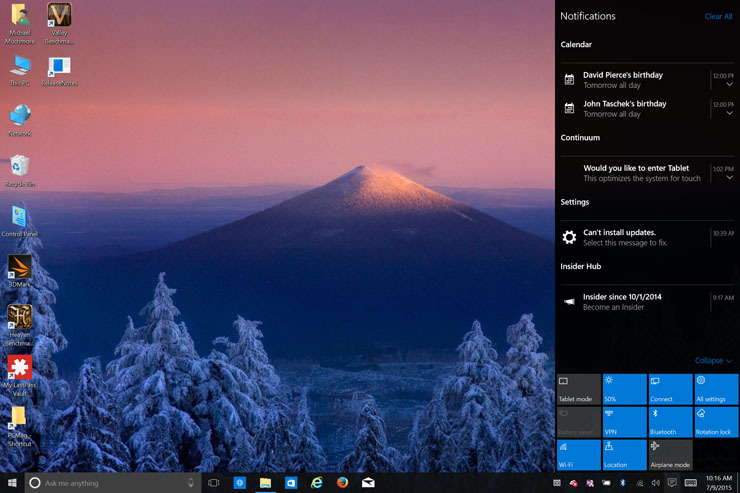 In Windows 10, this Action Center is located inside the slide out panel, which can be obtained by selecting the Task Bar. It appears to be a very useful addition to Windows and can be personalized by the user. Here I provide you details about some of its useful features. With the help of Quick Actions you will be able to regulate the brightness of your screen. You will be able to perform various other tasks like turn on or off WiFi, On or Off Quiet Hours, where Windows 10 provides you with the silencing option and so on. When you select this option, formerly four options will be visible. You can’t increase the number of options, but you decide which all options to be made available on Quick Actions. For this you have to select Settings and then select the option named System. From there you have to opt for Notifications & Actions. There you can find the option named Quick Actions. On selecting this you may find four boxes, each indicating one action each, which can be seen throughout. There you can select each action which will be placed in these four options. Show Me Tips About Windows: When you Turn On this option, Windows 10 will timely displays certain tricks and tips with the help of Notification option. This may come to your aid if you are not a well-versed Windows user. Show App Notifications: If you Turn On this option, you will get certain notifications from the applications that you have installed in your system. Show Notifications on Lock Screen: This will enhance the notifications while you are away from your system. This will help in receiving certain notifications on the lock screen, even when you are away from your system for a fairly long period of time. Show Alarms, Reminders and Incoming VOIP calls on the Lock Screen: If you turn on this option, then you will be able to remind about your appointments in advance, just by looking at your screen. But if you mind your privacy, then it is advisable to turn this option off. Hide Notifications while Presenting: Turning on this option will automatically prevent the notification from appearing on the screen while you are presenting some PPT presentations. Sometimes you may become annoyed of receiving notifications every time when you receive an email message. Windows 10 allows you to turn off such hilarious notifications on individual basis. For altering the settings you have to select Settings>> System>> Notifications & Actions and then select Show Notifications From these Applications. To mute al the notifications, you have to Turn Off the switch for the particular app. On the other hand, if you choose to receive only some notifications then you have to select the name of the application. Next you have to select Settings. Here you can allow or disallow notifications and sound accordingly. After a certain period of time, you system will be accumulated with a number of notifications from the Action Center. But you don’t have to worry. You can clean those in seconds. All you have to do is to open Action Center. You are allowed to delete notifications either on individual basis or in bulk. For cleaning notifications individually, you have to select those notifications individually and delete them. If you prefer to clean up an entire section, then you have to select the whole section and hit the delete key. In the end you want to clean the whole notification, then you have to select the option of Clear All, which you can see on the right corner of the upper side of Action Center Panel.